Preble High School had the largest food collection pile and received the $2,000 grant to their music program. 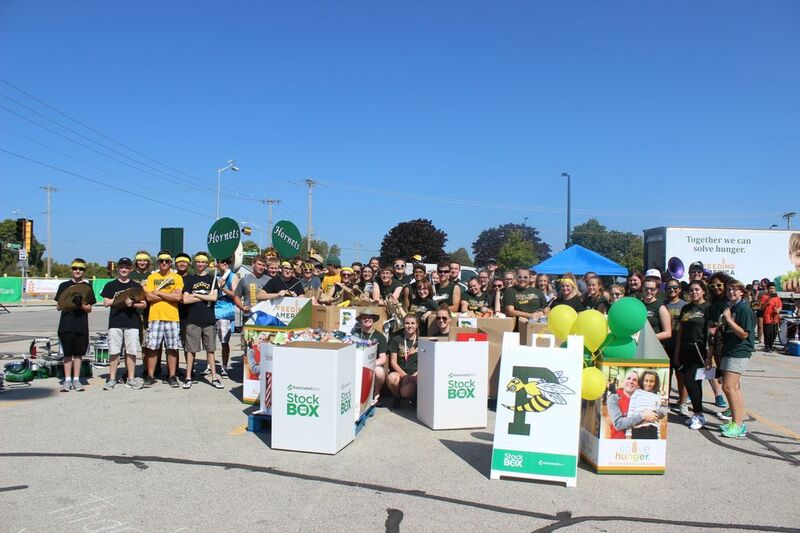 GREEN BAY, Wis. – September 27, 2017 – Associated Bank’s Stock the BoxTM for Hunger campaign to benefit Feeding America Eastern Wisconsin, now in its second year, recently celebrated with a food collection and pep rally at Lambeau Field in partnership with the Green Bay Area Public School District and the Green Bay Packers. Green Bay East, West, Preble and Southwest high school bands were challenged to a friendly competition to collect the largest food collection pile. Nearly 9,400 pounds of food was collected by the four schools and middle schools, equating to 7,800 meals. This is almost a 90 percent increase from the amount of food that was collected last year. "I am extremely proud of the Green Bay students who surpassed the collection numbers in a huge way this year,” said Dr. Langenfeld, superintendent of schools and learning. “The Green Bay Area Public School District has an expectation and a tradition of giving back to our community and this collection is a perfect example of that." Preble High School had the largest food collection pile and received the $2,000 grant to their music program. The three remaining schools each received a $1,000 grant. To further recognize the hard work of the students, staff and families supporting this important community effort, Associated Bank further provided an additional $500 each to Green Bay East, West and Southwest high school bands. According to Megan Sweeney, band director at Preble High School, the money will be used to upgrade their parade banner and purchase an American flag and Wisconsin state flag, in time for their performance in the NYC St. Patrick's Day Parade in March. Sweeny also said the band is working toward purchasing new platforms for the drum majors for marching band performances. The food will be distributed to Feeding America Eastern Wisconsin member pantries, shelters and meal programs throughout the area.